You can dry sugar flowers slowly and naturally at room temperature which can take several days, especially the larger flowers that are built in layers, each layer needing to be dried before adding the next one. However, if you are like me and always short of time, it’s worth using appliances that you may have around your house to cut the time down considerably. If you haven’t got time to wait until the gum paste flowers dry naturally you can speed things up by using a lamp, a hairdryer, an oven or invest in a dehydrator, all of which cut down the drying time considerably. But, whichever way you choose you should know why care must be taken, so they look perfect when they are dried. How long does it take for Sugar Gum Paste Flowers to dry? It will depend on how thick or how thin your flowers are. Naturally, the thinner ones will dry faster, and they will be hard to the touch within a few hours. However, they will not be properly dry and will break if they are touched or if they are vibrated during transportation. Depending on how thick the parts or the whole flowers are, it can take between 48 hours and a week to dry right through. If you are making flowers for a special occasion cake, it is advisable to make them well ahead of the time you need them, leave them out to air dry, in a safe place, away from the chance of anyone touching them. I say that because anyone who sees sugar flowers, especially for the first time, usually has the urge to touch them and if they are very fresh, they will immediately break. Guests at weddings are the usual culprits, and this practice has to lead to some disappointed brides having ruined cake decorations, so it is best to make sure they are totally dry before you put them on a cake. If you make other decorations from gum paste for your cake, e.g., a cake topper, then those should be made well ahead of time because they will take much longer to dry right through. If you don’t have the time to allow, the more complex type of decoration to dry then perhaps you should consider using one bought from a cake decoration supplier. When drying sugar flowers, it is best done if they are left out at room temperature to dry naturally, but If you have left making the flowers for a cake until the last minute, then there are ways you can dry them faster. If you are learning how to make flowers and are doing so to learn an art form then speeding up the drying process will not be vital for you unless its to dry the parts of the flowers faster so you don’t have to wait in between stages and can get on with making the whole flower. Faster drying times are usually needed when you decide to use the flower making skills you have mastered to decorate cakes. In an ideal world, sugar flowers should be made well ahead of the time they are needed. If you only make a few cakes, then it is possible, but as you get busier by agreeing to make more cakes you may find you are making the flowers nearer the time you need to use them, and have limited time to dry your flowers, then there are ways to speed up the process. The key to speeding up the drying process is to make your flowers petals and leaves as thin as is practical. If the flowers are for display purposes only, by that I mean that they have been made to take a photograph of them or for a competition where they will not be touched, and they will be appropriately packed with little risk of vibration during transportation, then the thinner, the better. However, if they will be displayed in a place where they may be touched (remember what I said about wedding cake flowers being touched), or transported to a venue especially if it’s not by you or someone who realizes how delicate they are, then they need to be made not quite as thin and fragile to prevent breakages. Years ago when I was teaching Sugar gum paste flower making and cake decorating in a college in England, I had a friend who had a hotel that catered for weddings. During the summer there would be a wedding every Saturday and every Saturday I would receive a phone call to ask me to rush to the hotel to repair a wedding cake that had been delivered. It was devastating how a beautiful cake could be ruined in transportation, and the biggest culprit was the flowers that hadn’t been left to dry properly, made too thin and had broken. A lot of times it was impossible to repair them in the time I had before the reception, so I had to remove the smashed flowers from the cake and redo the piping. I can only imagine the disappointment that was caused because the baker didn’t know how to dry the flowers thoroughly or make them look delicate but sturdy enough to be transported. I only did it for one summer as I didn’t want the responsibility for the repairs and told the owner to send his customers to me for a cake that wouldn’t be ruined when it arrived at his hotel, and he did, and from then on he had no more ruined cakes. For flowers such as roses that have a thick base and multiple petals, consider building your flower around a polystyrene former as opposed to making the base of the flower out of gum paste. Formers come in a variety of shapes and sizes and can be bought from a cake decorating suppliers or a hobby shop. 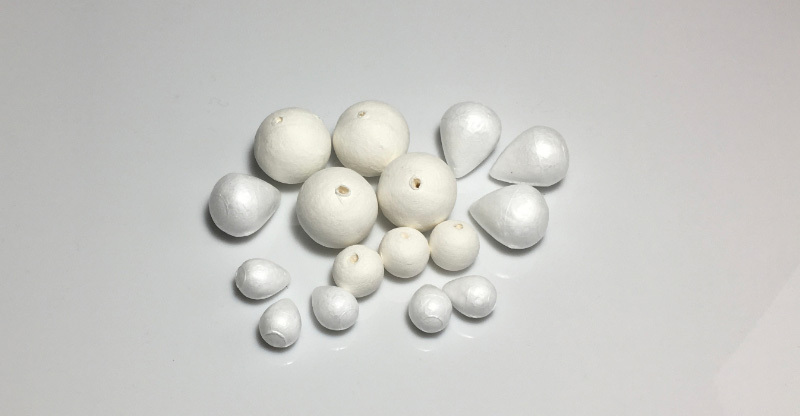 Two sizes of round and teardrop polystyrene formers that are used as the base for gum paste flowers and they come in multiple shapes and sizes. Drying your gum paste flowers starts as soon as you cut out the first petals and leaves because many flowers are made in stages and each petal needs to be dried individually which can take several hours and then is constructed after everything has dried. Some flowers are built up layer by layer, and each layer needs to be dried for 24 hours so the next layer can be added. When all the layers have been added, it can take several days to dry completely. These are ways that you can speed up the drying process on a table or a worktop. Using a small fan – without having the fan too close, aim the airflow at the sugar paste flowers to be dried but use a gentle setting that doesn’t vibrate them. Using a table lamp – works quite well but don’t put the flowers too close and don’t leave too long under the lamp or the colors will fade. Using a hairdryer – works well on a larger flower if you set it to cold or just warm, use a gentle airflow setting and don’t place it too near or the shape of the flower will get distorted. A hairdryer is not good for drying individual petals as they will blow away. Another way to dry your sugar flowers is to place them on a tray or a stand and put them in an oven with just the light on which will give off enough heat to dry them. Leave them overnight, and they should be dry, but again, if they are very thick, it may take longer. You can also use this method to dry parts of your flowers (petals and leaves) while you are working as they will not be blown around and they will dry quickly, and you can get on with making the next part of the flower without too much delay. An oven warming drawer works also works well if you put it on the lowest temperature setting. If you use your oven frequently for cooking and you don’t want it overtaken by sugar flowers you could always invest in a dehydrator. I don’t have a dehydrator, but it is on my ‘wish list,’ and I intend to buy one very soon because I have only heard positive things about this method of drying Sugar Gum Paste Flowers. I have read a lot of reviews about dehydrators and talked to flower artists who use them, and the best advice they have given me is to get one with adjustable heat control. It is important because you will need to set it to warm because only one temperature setting may be great for drying food such as meat, fruit, and vegetables but far too hot to dry sugar flowers. Another thing to look for when buying one is to make sure it has a timer, so you don’t forget it when you get busy, and it will turn itself off. Testing is essential – every fan, table lamp, hairdryer, oven, and dehydrator is different so whichever method you choose to speed up the drying time of your Sugar Gum Paste Flowers and decorations before you start drying anything important the first and most important thing you must do is to do a test. Use some of your flowers that you don’t mind being destroyed (broken ones or extra ones) and time how long they take to dry and to check to see if the temperature is correct. That way you won’t ruin any flowers you have made for a special occasion. If your flowers don’t dry then, it may be down to other reasons. This may be because of the ingredients you are using to make your flowers. Some ready-made sugar paste or gum paste powder that you mix yourself doesn’t dry very well, and it may be down to the fact that the gum tragacanth or CMC is not fresh enough before manufacturers have made the product and put their own “sell by “ dates on them. Also, if you make flowers with gum tragacanth or CMC mixed with fondant, it sometimes won’t dry properly because, remember, fondant is produced to cover a cake not make flowers. It is made with ingredients so that when a cake is covered it will crust over but it’s still soft enough to be able to cut the cake and not set as hard as Royal icing where sometimes cutting the cake is almost impossible. Again, your Gum tragacanth or CMC may be too old and won’t work well anymore. If you use a liquid color instead of gel color in your Gum Paste, that can also affect how well the paste will dry. 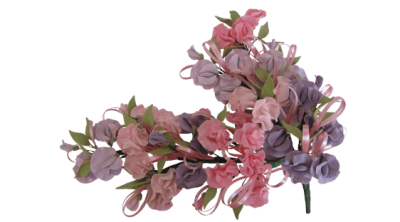 Of course, if you live in an extreme climate, it is sometimes challenging to dry sugar flowers, but there are things you can do to help in those situations. Another thing that can stop your flowers and decorations drying is if you live in a place where it is hot and humid. Fortunately for me, I live in Europe and have never experienced extreme humidity that persists for a long time, but I have cake artist friends who do, and I know it is a big problem for them. All I can suggest is that you try some of the drying methods we have already discussed, and there is a link below for a blog post on my website the deals with dealing with Sugar Flowers in extreme weather conditions and for a gum paste recipe that is good for extreme weather conditions. If you would like a recipe to use in humid conditions, my friend, who has to battle that condition daily, passed it on to me and she said it works very well. Good Ideas for Speeding up Drying Time? 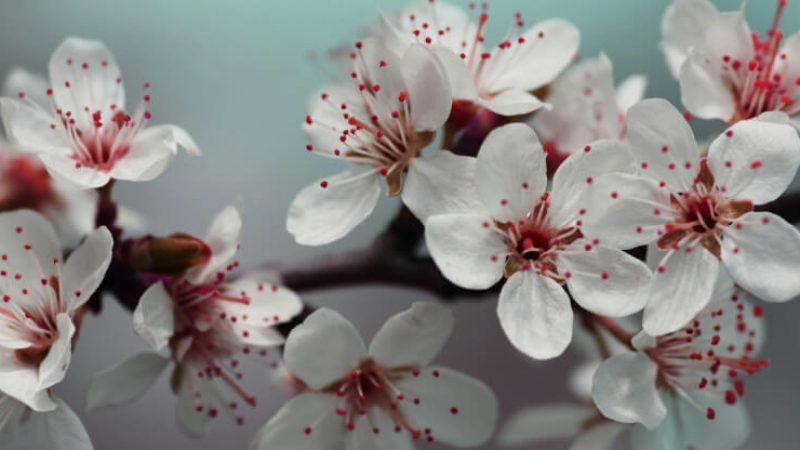 I hope this article has given you some good ideas about how you can dry your sugar flowers naturally or how to speed up the drying times by using appliances you have in your home or using a dehydrator. Also, I have suggested that you make it easier to dry large flowers by building them around a polystyrene former rather than mounting them on a gum paste base. I have talked about how to deal with drying your gum paste flowers if you live in a place that has a humid climate which makes it difficult to dry them.